Revelle Lecture at Scripps: Are We Underestimating the Risk of Tsunamis? WHAT: Eddie Bernard, scientist emeritus for the National Oceanic and Atmospheric Administration’s (NOAA) Pacific Marine Environmental Laboratory (PMEL) and former director of NOAA’s Pacific Tsunami Warning Center, will present “Tsunamis: Are we underestimating the risk?” during the 13th annual Roger Revelle Commemorative Lecture, presented by the Ocean Studies Board, part of the U.S. National Research Council. In recent years tsunamis have wreaked broad devastation, from the 2004 Indian Ocean tsunami, in which hundreds of thousands of people lost their lives, to the destruction in Japan just over a year ago. As a result, countries around the world are addressing the hazards associated with tsunamis. Bernard will describe threats to the United States and how coastal communities can best prepare for a devastating tsunami. WHEN: Tuesday, April 17, 2012, 4 p.m.
WHERE: Robert Paine Scripps Forum for Science, Society and the Environment (Scripps Seaside Forum); 8610 Kennel Way, just north of El Paseo Grande on the Scripps campus in La Jolla. BACKGROUND: Following the horrific Dec. 26, 2004, Indian Ocean tsunami, which killed more than 230,000 people and displaced 1.7 million across 14 countries, it became apparent that many Indian Ocean nations did not have tsunami preparedness programs in place (in fact, many did not even recognize the word “tsunami”). Japan, on the other hand, is the most tsunami-prepared nation in the world. Yet devastation from its March 2011 earthquake and tsunami was caused by an underestimation of tsunami impacts in evacuation planning and coastal structure design. The event caused nearly 20,000 deaths and some $220 billion in economic loss. “In light of Japan’s underestimation of the tsunami hazard, the U.S. should pledge to become a more tsunami-resilient nation,” said Bernard. This can be achieved, Bernard believes, through the reauthorization of the Tsunami Act, which includes elements of research, education, warning and international cooperation. Eddie Bernard in Kesennuma, Japan, one of the coastal towns severely damaged by the March 2011 tsunami. 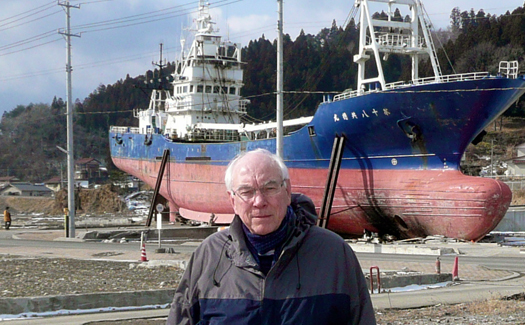 The ship in the background was deposited about a half-mile inland by the tsunami. 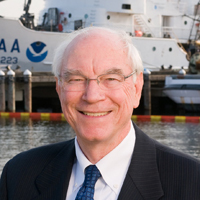 Bernard is currently an affiliate professor at the University of Washington and NOAA scientist emeritus. He retired as director of PMEL in 2010 after 40 years of NOAA service that included ocean climate dynamics, fisheries oceanography, El Niño forecasts, tsunamis and underwater volcanoes. He served as director of NOAA’s Pacific Tsunami Warning Center in Honolulu for three years. The Revelle Lecture, part of the Scripps Distinguished Lecture Series, was created by the Ocean Studies Board to honor former Scripps Oceanography Director Roger Revelle for his contributions to ocean sciences and his dedication to making scientific knowledge available to policymakers. Bernard’s presentation is the fifth Revelle Lecture scheduled to be given on both West and East coasts. Bernard delivered the lecture on March 20 at the Smithsonian National Museum of Natural History in Washington, D.C.
Roger Revelle (1909-1991) was director of Scripps Institution of Oceanography from 1951 to 1964. He was one of the nation’s most prominent oceanographers, a pioneer of climate change research and a world leader in the application of science and technology to help solve problems in developing countries. Long associated with the University of California, Revelle’s vision and energies led to the establishment of the UC San Diego campus in 1960.